One of my favourite documents in our collection is about swimming. 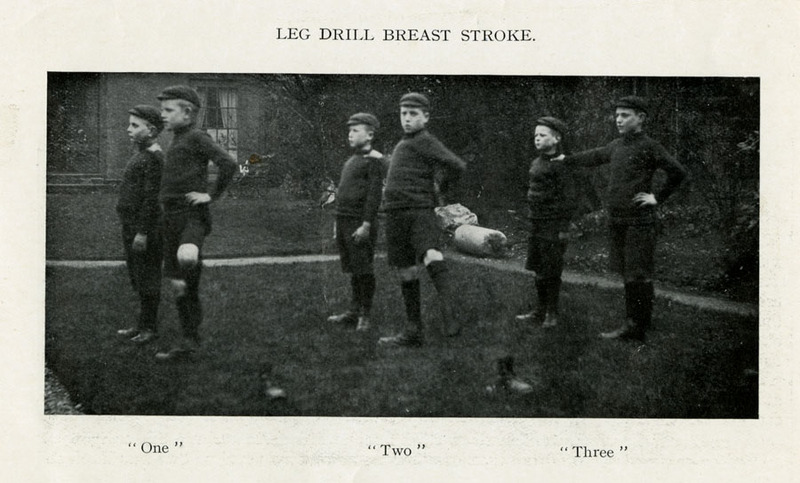 Within the records of the children’s homes that were run by The Children’s Society, there are a number of documents that mention physical exercise. 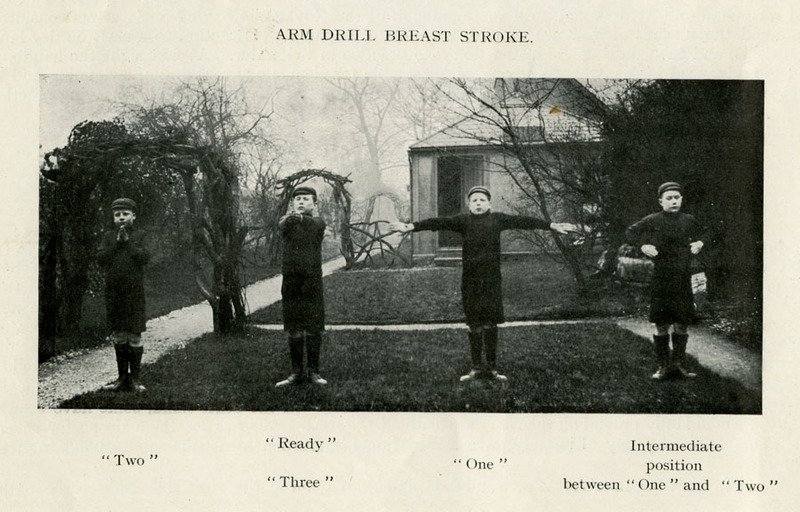 This suggests that exercise was something that the children in the homes were encouraged to participate in. The boys living at St Mark’s Home for Boys in Natland, Cumbria, in the early-20th Century were known for swimming, and a number of boys from the home had been awarded swimming certificates by the Royal Life Saving Society. The secret of St Mark’s Home’s swimming success was down to the way the boys were taught to swim. In fact, their method was seen as so effective that the home published a manual for other swimming instructors to learn from. The method now adopted is to instruct and drill our beginners in class on land until they are at home with every position and movement for breast stroke, and the positions for floating and diving; at least a dozen drills, occupying a quarter of an hour each drill, are necessary before taking the class to the baths at all. 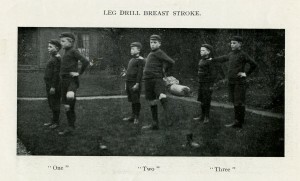 Helpfully, the manual comes with photographs of the boys doing their land drills for different swimming strokes, showing the positions they needed to learn and the numbers they had to call out while doing the drills. Confidence is all-important to the learner, so no ducking is allowed, and we think the method of teaching by throwing a water-shy boy or any other boy into deep water is the last effort that should be resorted to. Lying beneath these words is a hint at how other instructors were teaching children to swim at the time. I don’t know about you, but I certainly know which method I’d prefer! One of the series of records that have been catalogued as part of this project are the minutes of the Halliwick Penguins, a swimming club based at Halliwick School For Girls, Winchmore Hill, London. The home started out life as the Cripples and Industrial School on the Marylebone Road in London, being established by Miss Caroline Blunt in 1851. The school relocated to Winchmore Hill in 1911, and was transferred to The Children’s Society (then known as the Waifs and Strays Society) in 1927. Under The Children’s Society, the home changed its name to Halliwick School For Girls and was certified with the Ministry of Education as a special school for disabled children. In its early years, Halliwick School For Girls took in around 60 girls from ages five to sixteen. These girls would be taught skills such as dressmaking and needlework. As with other disabled children’s homes in the early 20th century, Halliwick carried out treatments and therapies for certain conditions, such as artificial sunlight therapy to help children with rickets and forms of tuberculosis. In the early 1950s, staff at Halliwick School For Girls began experimenting with swimming therapy; their aim being to help children with mobility difficulties to learn to swim and gain a freedom of movement. The swimming therapy went so well that in 1951 the school opened its own swimming club, known as the Halliwick Penguins. 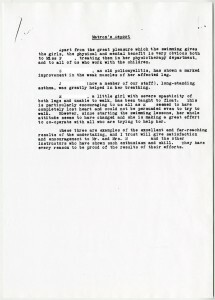 Above is a report by the matron of the home, which has been found among the minutes of the Halliwick Penguins, dated 1951. 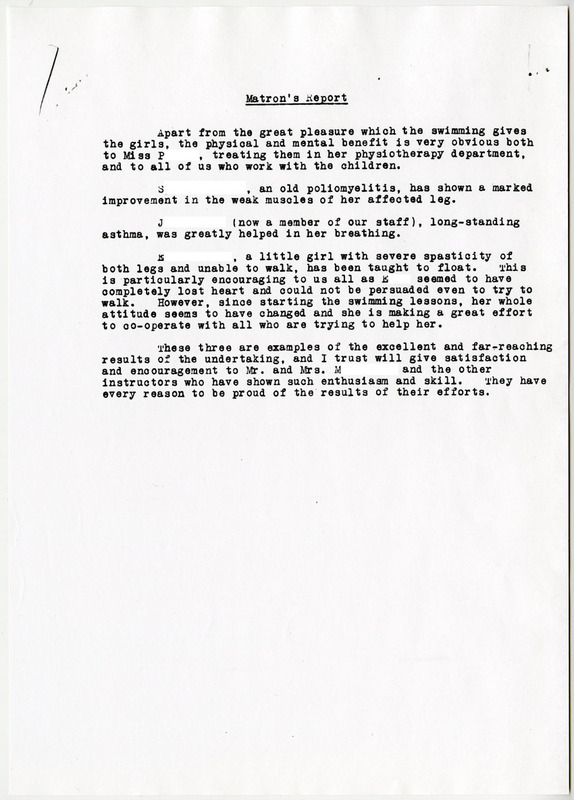 In this report the matron notes the affect of the swimming therapy on some of the girls in the home; from the sounds of it, the swimming therapy was very successful in giving the girls more mobility and in boosting their self-esteem. The Halliwick Penguins went from strength to strength. In 1952 the Association of Swimming Therapy was established at Halliwick with the aim of setting up similar swimming clubs throughout the country and teaching disabled people to swim using the ‘Halliwick Concept’. Halliwick School For Girls had closed down by the 1980s as The Children’s Society moved towards more innovative forms of childcare. However, the Halliwick Association of Swimming Therapy is still going strong and continues to use the Halliwick Concept to teach disabled people to swim, giving them a sense of freedom and mobility in the water. More information about Halliwick School For Girls can be found here. The website for the Halliwick Association of Swimming Therapy can be found here.